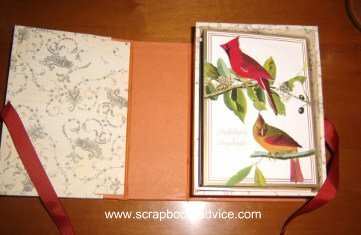 Have you ever thought about creating some Home Decor with Scrapbook Supplies. Here are some creative ways to use your scrapbooking supplies to create some Home Decor items. 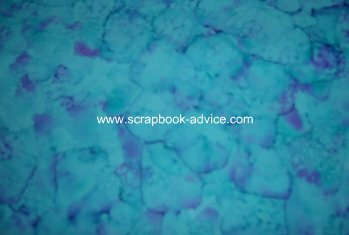 Take a look at these and see if you can come up with some New uses for scrapbook supplies and some neat items of your own. 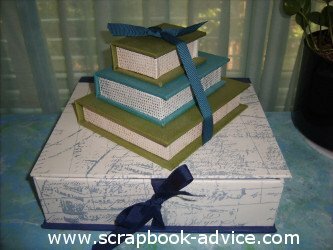 Send us an email through our contact page at Scrapbook-advice.com and a photo so we can post your creations here. We are looking for lots of New uses for scrapbook supplies. Please put "Home Decor with Scrapbook Supplies" in the about field. 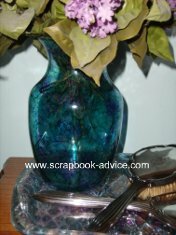 I couldn’t find a Vase that matched the drapes in my bedroom, so I tried some Tim Holtz® Adirondack® Alcohol Inks, Alcohol Blending Solution, the Alcohol Ink Applicators and a small felt pad. I covered the Vase with 3 colors of the inks and blending solution until it came close to the colors in my drapes. The vase was left over from a gift of flowers and didn't cost me anything. 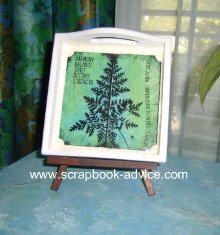 I continued to play with the Alcohol Inks and added them to the cut glass tray underneath and a cut glass cover for a Tissue Box. These are my latest attempts at Home Decor with Scrapbook Supplies. This plastic serving tray I picked up for a dollar to use for a picnic. I used three colors of Tim Holtz® Adirondack Alcohol Inks, Adirondack® Alcohol Ink Metallic Mixative™ in Silver, and Alcohol Blending Solution to transform it into a decorative piece that I use in the living room. 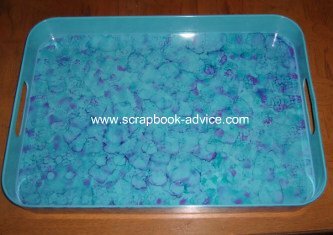 Here is the detail of the pattern that the Alcohol Inks created on the plastic tray. This little 6 inch square tray was unpainted wood which I sanded just to make all the surfaces smooth. Then I painted with some Semi-Gloss White Paint left over from another craft project, but any small 1 oz or 2 oz bottle of craft paint in any color would do. The kit came with mosaic tiles in blues and greens, but I decided instead, to put these two card stock tags from the Refresh Kit and used crystal glaze over the top to give it a waterproof and permanent finish. The tag on the left says “Harmony, Balance, Spirit, Destiny, and Strength.” The tag on the right says “Patience, Strength, Perseverance, Purity and Grace. I use it as a picture on the little easel, but it could also be used flat as a tray. The sides and handles could also be decorated with scrapbook paper, stamps, tags, ribbons and fibers. Just do whatever your imagination can dream up for Home Decor with Scrapbook Supplies. 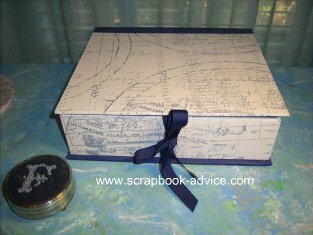 This blue and white Drop Spine Box was my first experience at Home Decor with Scrapbook Supplies. This was made with matte board, scrapbook papers and navy grosgrain ribbon at a Club Scrap Retreat several years ago. It’s about 9 ½ x 10 ½ inches and about 3 inches deep. Here is the Letter/Card Box open which gives you a look at the "Drop Spine." 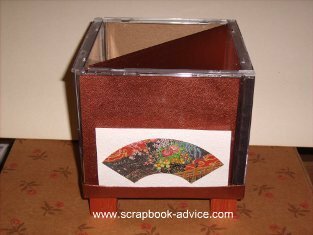 I use this one to store my hand made cards, many of which are from Club Scrap as well. I have made several others since as gifts - usually with photos in them - and I also have several others I use for cards and stationary. These two Drop Spine Boxes are a smaller version of the above box. I use them to store my A2 cards that are purchased. The finished size of the boxes is about 5 ½ x 7 ½ inches and about 3 inches deep. Here are the two smaller boxes as they look open. Here are the two smaller boxes as they are kept stacked on the dresser. Here, I have them stacked and tied the with ribbon, but they can be used separately or even given with a gift enclosed. Mine hold little trinkets from my childhood. It has not occurred to anyone that they are Home Decor with Scrapbook Supplies. This Valet was made from matte board, Scrapbook paper and card stock in Eggplant, Deep Blue and Deep Green. 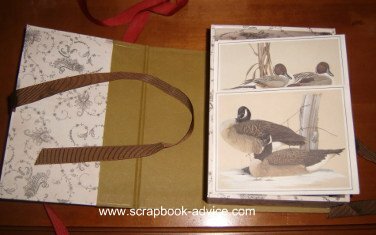 The Valet book is another drop spine box about 6 x 12 inches and about 1 & 1/4 inch deep. Here is the Valet with each of the storage boxes open. This can be a great Item for Home Decor with Scrapbook Supplies or even a place to put some of your scrapbooking embellishment items or a gift, depending on how you decorate it. 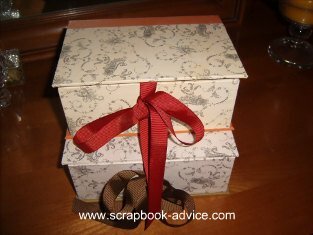 One larger Jewelry Box is attached on the left with cotton - the cover is decorated with a tag from the kit that says “The secret to having it all is believing you already do.” The edge of the cover is decorated with an eggplant braid. The center of the box contains a Mini Photo Album that has 10 pages of card stock in varying colors of eggplant, deep blue, deep green and gray. 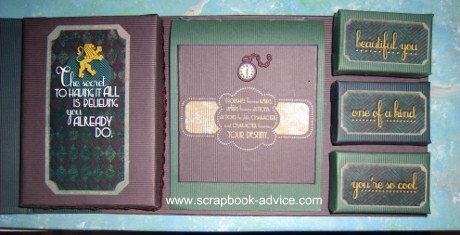 The Photo Album is decorated on the top with a Pocket Watch embellishment, and a tag from the kit that says “Thoughts become Words, Words become Actions, Actions become Character, and Character becomes Your Destiny." 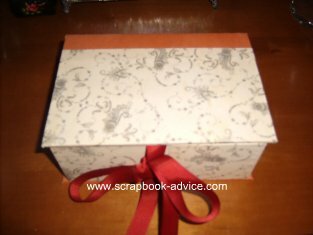 The right side has three smaller Jewelry Boxes with cotton - the covers are decorated with tags from the kit that say “Beautiful You”, “One of a Kind”, and “You’re so Cool”. Another cool project made from matte board, craft paint, wooden rods & knobs that turns into a Business Card or Artist Trading Card (ATC) holder. 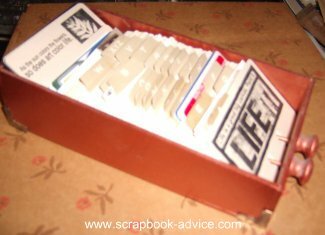 I added A-Z Rolodex cards, but you could always use ATC’s or another type of divider. While I painted mine with the copper-colored craft paint to match my office, any color will do - even covering with scrapbook paper and other embellishments. Club Scrap kits never cease to amaze me with the wonderful projects that they include in my monthly Club Scrap or Stamp kits. This one made from is made from papers in brown & copper metallic from the Ornamental Kit and the basis for it is 4 CD Jewel cases put together to form a cube and set atop 4 little square wooden feet that I painted with copper craft paint. I have this in my office, but I have not finished decorating the outside, so I am not yet storing anything in it - probably the future home of my pens and pencils. 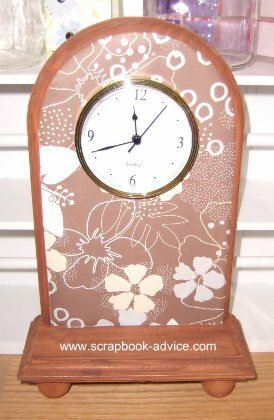 This was a small Wooden Clock with Wooden Ball Feet, that was first sanded and painted brown, then the front was covered with a brown and white printed scrapbook paper to match my craft room. Any type, color or weight of paper would work here, including a photo or any type of ribbons or scrapbook embellishments to make it your own. New uses for scrapbook supplies! I made this in a class at a Scrapbook Expo so there was only a very small selection of embellishments - but I liked it just the way it was when I got home and decided not to add anything to it. 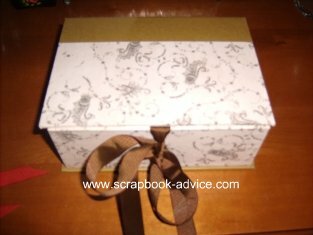 My latest creation of Home Decor with Scrapbook Supplies is this Photo File Box. Well, I just couldn't resist. I had some left over paint and a black photo file box that I had just purchased from A.C. Moore for about $5.50 and so I tried the Background Paint Technique on it as well. The paint colors were from a paint job a while back in the master bedroom so I guess that's where the box will reside. But not a bad idea for an inexpensive Holiday gift. 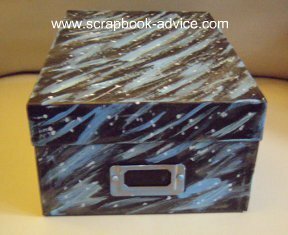 For a link to making the Background Paper that was the idea for this Photo Box, go to the Hand Painted Background Tutorial. I hope you enjoyed these Home Decor with Scrapbook Supplies ideas and I hope they have given you some ideas of your own. Please share them with us. We would love to know how you have created New uses for scrapbook supplies. Send us an email to our Contact Us Page and let us know what you have done. We would love to get it posted with a photo and short description of how you did it and what products you used - you will of course, get credit. You might also receive a little gift from us. Thanks for looking at our Home Decor with Scrapbook Supplies! 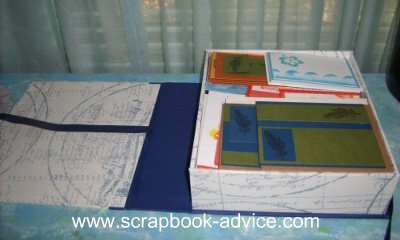 Check out our Scrapbook Tutorials Page for some more ideas. Home Decor with Scrapbook Supplies.